June 12, 2004–PWI: Ryan Drago & Mike Modest & Donavon Morgan defeated Sal Thomaselli & Mitsuharu Misawa & Yoshinari Ogawa. August 28, 2004–Pro Wrestling Iron: Nigel McGuiness defeated Ryan Drago..
December 14, 2004: Ryan Drago participated in a tryout in front of Pro-Wrestling NOAH office staff..
December 17, 2004–FUSION: Ryan Dragon fought Jay Lethal in what was called by many, the match of the night. December 3, 2005–Ring of Honor: Ryan Drago fought Oliver John in a dark match at Ring of Honor..
January 15, 2006–Pro Wrestling WAR: Ryan Drago fought Davey Richards at Pro Wrestling WAR..
February 18, 2006 – TNA Impact: LAX (Konnan/Homicide/Machete) beat La Migra (Donovan Morgan/Mike Modest/Ryan Drago)..
March 25, 2006–Supreme Pro Wrestling: Ryan Drago defeated Timothy Thatcher..
June 9, 2006–Full Impact Pro: Korey Chavis defeated Ryan Drago..
June 10, 2006–Full Impact Pro: Chasyn Rance beat Korey Chavis and Kenny King and Ryan Drago in a 4-WAY..
July 8, 2006–Coastal Championship Wrestling: Ryan Drago defeated Shane McLane..
February 24, 2007–California Championship Wrestling: Virgil Flynn defeated Ryan Drago..
October 20, 2007–EPWW: Ryan Drago defeated Chimaera by disqualification..
October 28, 2007–SPW: The Suburban Commandos defeated Ryan Drago & Luster the Legend & Wage..
February 23, 2008–EPIC Pro Wrestling WAR: Ryan Drago defeated Chimaera..
July 19, 2008–EPIC Pro Wrestling War: Tim Donst beat Jimmy Rave and Ryan Drago in a 3-WAY to win EPWW title..
March 6, 2009–WLW: Bao Nguyen defeated Ryan Drago. March 27, 2009–Chikara: Arik Cannon, Darin Corbin and Ryan Cruz defeated Austin Aries, Ryan Drago and Tony Kozina. March 29, 2009–Chikara: Ryan Drago and Tony Kozina was in a 12 man tag team gauntlet match won by Jigsaw and Mike Quackenbush. July 10, 2009–WLW: Ryan Drago defeated Trent Stone. September 12, 2009–WLW: Bao Nguyen defeated Ryan Drago. October 3, 2009–WLW: Bob Evans, Ryan Drago and Trent Stone defeated Alex Plexis, Kenny Lush and Mike Rollins. October 17, 2009–WLW: Ryan Drago defeated The Cancun Kid. November 21, 2009–WLW: Mark Sterling defeated Ryan Drago and The Cancun Kid in a 3-way match. March 5, 2010–WLW: Ryan Drago was in a #1 contender for the world heavyweight title in a battle royal won by Trent Stone. March 6, 2010–WLW: Ryan Drago defeated Jason Jones in the 1st round. Superstar Steve and Mark Sterling defeated Ryan Drago and Brian Breaker to win the vacant tag team titles. March 12, 2010–WLW: Ryan Drago was in a #1 contender for the world heavyweight title in a battle royal won by Trevor Murdoch. March 13, 2010–WLW: Ryan Drago was in a #1 contender for the world heavyweight title in a battle royal won by Trevor Murdoch. April 24, 2010–WLW: Jack Gamble defeated Ryan Drago. May 22, 2010–WLW: Ryan Drago defeated Superstar Steve. WLW tag team champions Mark Sterling and Superstar Steve defeated Ryan Drago and Ethan Wright to retain the titles. June 11, 2010–MECW: Ryan Drago defeated Shank Barzini. July 17, 2010–WLW: Ryan Drago defeated Jack Gamble. August 14, 2010–MECW: JP Lightning defeated Ryan Drago. September 18, 2010–MECW: The Canadian Cougar defeated Ryan Drago. October 9, 2010–WLW: WLW tag team champions Mark Sterling and Superstar Steve defeated Ryan Drago and The Cancun Kid to retain the title. January 15, 2011–WLW: Jack Gamble defeated Ryan Drago and Jeff Strong in a 3-way match to become #1 contender for the WLW heavyweight title. March 12, 2011–WLW: Ryan Drago defeated Jeff Strong. March 19, 2011–WLW: Ryan Drago defeated Superstar Steve. March 25, 2011–WLW: Ryan Drago defeated Ethan Wright. March 26, 2011–WLW: Ryan Drago defeated Jack Gamble in the 1st round. Jason Jones defeated Ryan Drago to win the tournament. April 8, 2011–WLW: Ryan Drago defeated Jack Gamble. April 16, 2011–WLW: WLW tag team champions Ethan Wright and The Cancun Kid defeated Ryan Drago and Mark Sterling to retain the titles. August 13, 2011–MPW TV: Ryan Drago defeated Pete Madden. September 16, 2011–MPW TV: Brett Young and Ryan Drago defeated Pete Madden and The Magic Man. NWA Central States champion Jeremy Wyatt defeated Ryan Drago to retain the title. September 17, 2011–WLW: Mark Sterling and Ryan Drago defeated Dustin Bozworth and Mike Sydal. September 18, 2011–WLW: Ryan Drago defeated Mike Sydal. October 1, 2011–WLW: Jack Gamble and Jeff Strong defeated Endy Starr and Ryan Drago. October 2, 2011–WLW: Endy Starr, Jason Jones and Jeff Strong defeated Brian Breaker, Bull Schmitt and Ryan Drago. Ryan Drago defeated Jason Jones. October 8, 2011–WLW: WLW heavyweight champion Brian Breaker defeated Ryan Drago and Superstar Steve in a 3-way match to retain the title. October 22, 2011–WLW: Dustin Bozworth, Jeff Strong and Ryan Drago defeated Ethan HD, Lee Walker and Sir Bradley Charles. November 5, 2011–MPW TV: NWA Midwest tag team champions Jimmy Rockwell and Zach Thomson defeated Ryan Drago and Brett Young to retain the titles. November 12, 2011–WLW: WLW heavyweight champion Brian Breaker defeated Ryan Drago to retain the titles. December 10, 2011–MPW TV: Ryan Drago defeated Jack Gamble. February 10, 2012–WLW: Ryan Drago defeated Jack Gamble. WLW tag team champions Jack Gamble and Jeff Strong defeated Ryan Drago and Mark Sterling to retain the titles. March 3, 2012–WLW: Ryan Drago defeated Jack Gamble. WLW tag team champions Jack Gamble and Jeff Strong defeated Ryan Drago and Superstars Steve to retain the titles. March 24, 2012–WLW: WLW heavyweight champion Jason Jones defeated Ryan Drago by count-out to retain the title. April 20, 2012–WLW: Ryan Drago defeated Britton Tucker. April 21, 2012–WLW: Jeff Strong defeated Ryan Drago and Britton Tucker in a 3-way match. April 27, 2012–WLW: Elvis Aliaga defeated Ryan Drago and Superstars Steve in a 3-way semi-finals match. April 28, 2012–WLW: Ryan Drago defeated Britton Tucker and Mark Sterling in a 3-way match. May 5, 2012–NWA Metro Pro Wrestling: Ryan Drago defeated Steve Fender. June 2, 2012–MPW TV: Dan Walsh defeated Ryan Drago. June 15, 2012–WLW: Ryan Drago defeated Elvis Aliaga. September 22, 2012–WLW: Jon Webb defeated Ryan Drago. November 3, 2012–WLW: Ryan Drago and Elvis Aliaga defeated Britton Tucker and Chris Wallace. November 10, 2012–WLW: Ryan Drago and Elvis Aliaga defeated Jack Gamble and Jon Webb to win the tag team titles. December 1, 2012–WLW: WLW tag team champions Ryan Drago and Elvis Aliaga defeated Jon Webb and Jack Gamble to retain the titles. December 8, 2012–WLW: WLW tag team champions Ryan Drago and Elvis Aliaga defeated Dark Shadow and Michael Magnuson to retain the titles. February 2, 2013–MPW TV: Ryan Drago defeated Iceman. February 9, 2013–WLW: Michael Magnuson defeated Ryan Drago. WLW tag team champions Ryan Drago and Elvis Aliaga defeated Dark Shadows and Michael Magnuson to retain the titles. February 10, 2013–WLW: Michael Magnuson defeated Ryan Drago in the 1st round. February 24, 2013–WLW: Ryan Drago defeated Britton Tucker. WLW tag team champions Ryan Drago and Elvis Aliaga vs. Jack Gamble and Jon Webb ended in a no contest. March 2, 2013–WLW: Michael Magnuson defeated Ryan Drago. WLW tag team champions Ryan Drago and Elvis Aliaga defeated Dark Shadows and Michael Magnuson to retain the titles. March 9, 2013–MPW TV: Ryan Drago defeated Bradley Charles. March 10, 2013–WLW: Ryan Drago defeated Kris Wallace. WLW tag team champions Ryan Drago and Elvis Aliaga defeated Dave DeLorean and Jack Gamble to retain the titles. April 13, 2013–MPW TV: Mark Sterling defeated Ryan Drago. April 19, 2013–WLW: Britton Tucker and Kris Wallace defeated Ryan Drago and Elvis Aliaga to win the tag team titles. April 26, 2013–WLW: Jack Gamble defeated Michael Magnuson and Ryan Drago in a 3-way match. April 27, 2013–WLW: Jack Gamble defeated Michael Magnuson and Ryan Drago in a 3-way match. June 1, 2013–MPW TV: Ryan Drago, Jon West and Maddog McDowell defeated Mark Sterling, Jake and Ryan King..
May 16, 2014 – NXT Live Event: Sylvester Lefort defeated Simon Gotch (Debut). June 19, 2014 – NXT: Aiden English and Simon Gotch defeated Travis Tyler and Angelo Dawkins. June 26, 2014 – NXT: Aiden English and Simon Gotch defeated Tee Perkins and Matt Sugarman. defeated Aiden English and Simon Gotch to retain the titles. June 28, 2014 – NXT Live Event: Simon Gotch and Aiden English defeated Colin Cassady and Enzo Amore. July 17, 2014 – NXT: Aiden English and Simon Gotch defeated Enzo Amore and Colin Cassady. July 24, 2014 – NXT: Kalisto and Sin Cara defeated Simon Gotch and Aiden English. July 26, 2014 – NXT Live Event: Aiden English and Simon Gotch defeated Scott Dawson and Dash Wilder. August 1-2, 2014 – NXT Live Event: NXT tag team champions Konnor and Viktor defeated Simon Gotch and Aiden English to retain the titles. August 7, 2014 – NXT Live Event: Aiden English and Simon Gotch defeated The Ascension in a non-title match. August 14, 2014 – NXT: Simon Gotch and Aiden English defeated Bull Dempsey and Mojo Rawley in the 2nd round of the NXT tag team titles tournament. August 21, 2014 – NXT: Simon Gotch and Aiden English defeated Enzo Amore and Colin Cassady in the semi-finals of the NXT tag team titles tournament. August 21, 2014 – NXT Live Event: Aiden English and Simon Gotch defeated Dash Wilder and Scott Dawson. August 23, 2014 – NXT Live Event: Aiden English and Simon Gotch defeated Dash Wilder and Scott Dawson. August 29, 2014 – NXT Live Event: Aiden English and Simon Gotch defeated Dash Wilder and Scott Dawson. September 4, 2014 – NXT: Sin Cara and Kalisto defeated Simon Gotch and Aiden English to become #1 contenders for the NXT tag team titles. September 5-6, 2014 – NXT Live Event: Aiden English and Simon Gotch defeated Dash Wilder and Scott Dawson. September 13, 2014 – NXT Live Event: Aiden English and Simon Gotch defeated Buddy Murphy and Wesley Blake. September 18, 2014 – NXT Live Event: Aiden English and Simon Gotch defeated Buddy Murphy and Wesley Blake. September 19-20, 2014 – NXT Live Event: The Ascension defeated Aiden English and Simon Gotch. October 2-4, 2014 – NXT Live Event: Aiden English and Simon Gotch defeated Wesley Blake and Buddy Murphy. October 9, 2014 – NXT: Aiden English and Simon Gotch defeated Colin Cassidy and Enzo Amore. October 10, 2014 – NXT Live Event: Aiden English and Simon Gotch defeated Colin Cassidy and Enzo Amore. October 11, 2014 – NXT Live Event: Colin Cassidy and Enzo Amore defeated Simon Gotch and Aiden English. October 17, 2014 – NXT Live Event: Colin Cassidy and Enzo Amore defeated The Ascension & Simon Gotch and Aiden English in a 3-way tag team match. October 18, 2014 – NXT Live Event: The Ascension defeated Aiden English and Simon Gotch and Colin Cassidy and Enzo Amore in a 3-way tag team match. October 23, 2014 – NXT: Aiden English and Simon Gotch defeated Wesley Blake and Buddy Murphy. October 24, 2014 – NXT Live Event: Sin Cara and Kalisto defeated Aiden English and Simon Gotch. October 30, 2014 – NXT: Aiden English and Simon Gotch defeated The Ascension, Wesley Blake and Buddy Murphy, Jason Jordan and Tye Dillinger & Colin Cassidy and Enzo Amore in a #1 contenders battle royal for the tag team titles. October 30, 2014 – NXT Live Event: Sin Cara and Kalisto defeated Aiden English and Simon Gotch. November 1, 2014 – NXT Live Event: The Ascension defeated Aiden English and Simon Gotch. November 6,8, 2014 – NXT Live Event: Aiden English and Simon Gotch defeated The Ascension. November 14, 2014 – NXT Live Event: Kalisto defeated Simon Gotch. November 20-21, 2014 – NXT Live Event: Kalisto defeated Simon Gotch. December 4, 2014 – NXT Live Event: Sin Cara and Kalisto defeated Simon Gotch and Aiden English. December 6, 2014 – NXT Live Event: Aiden English and Simon Gotch defeated Dash Wilder and Scott Dawson. December 11, 2014 – NXT Takeover R Evolution: NXT tag team champions Sin Cara and Kalisto defeated Aiden English and Simon Gotch to retain the titles. December 18, 2014 – NXT Live Event: Colin Cassady and Enzo Amore defeated Aiden English and Simon Gotch. December 19, 2014 – NXT Live Event: Simon Gotch and Aiden English defeated Dash Wilder and Scott Dawson. December 20, 2014 – NXT Live Event: Colin Cassady, Enzo Amore and Kalisto defeated Aiden English, Simon Gotch and CJ Parker. January 8, 2015 – NXT: NXT tag team champions Sin Cara and Kalisto defeated Aiden English and Simon Gotch to retain the titles. January 9-10, 2015 – NXT Live Event: Aiden English and Simon Gotch defeated Colin Cassady and Enzo Amore. January 16-17, 2015 – NXT Live Event: Buddy Murphy and Wesley Blake defeated Aiden English and Simon Gotch. January 21, 2015 – NXT: Buddy Murphy and Wesley Blake defeated Aiden English and Simon Gotch. January 23, 2015 – NXT Live Event: Aiden English and Simon Gotch defeated Colin Cassady and Enzo Amore. January 24, 2015 – NXT Live Event: Colin Cassady and Enzo Amore defeated Aiden English and Simon Gotch. January 30-31, 2015 – NXT Live Event: Buddy Murphy and Wesley Blake defeated Aiden English and Simon Gotch. February 6, 2015 – NXT Live Event: Buddy Murphy and Wesley Blake defeated Aiden English and Simon Gotch. February 11, 2015 – NXT Takeover Rival: Colin Cassady and Enzo Amore defeated Aiden English and Simon Gotch in a dark match. February 13, 2015 – NXT Live Event: Dash Wilder and Scott Dawson defeated Aiden English and Simon Gotch. February 18, 2015 – NXT: Colin Cassady and Enzo Amore defeated The Vaudevillains. February 20-21, 2015 – NXT Live Event: Blake and Murphy defeated The Vaudevillains. February 27-28, 2015 – NXT Live Event: Blake and Murphy defeated The Vaudevillains. March 5, 2015 – NXT Live Event: Finn Balor and Hideo Itami defeated The Vaudevillains. March 6, 2015 – NXT Live Event: Murphy defeated Simon Gotch. March 7, 2015 – WWE Experience tag 1: Colin Cassady defeated Simon Gotch. Murphy defeated Simon Gotch. March 8, 2015 – WWE Experience: Simon Gotch defeated Colin Cassady. March 27, 2015 – NXT Live Event: NXT tag team champions Blake and Murphy defeated The Vaudevillains & Colin Cassady and Enzo Amore in a 3-way to retain the titles. March 28, 2015 – Wrestlemania Fan Axxess: NXT tag team champions Blake and Murphy defeated The Vaudevillains in a non-title match. March 29, 2015 – Wrestlemania Fan Axxess: Simon Gotch defeated Sawyer Fulton. April 2, 2015 – NXT Live Event: Colin Cassady and Enzo Amore defeated The Vaudevillains. April 9, 2015 – NXT Live Event: The Vaudevillains defeated Chad Gable and Jason Jordan. April 10, 2015 – NXT Live Event: Colin Cassady and Enzo Amore defeated The Vaudevillains. April 11, 2015 – NXT Live Event: Blake and Murphy defeated Aiden English and Simon Gotch. April 16, 2015 – NXT Live Event: The Vaudevillains defeated Blake and Murphy & Chad Gable and Jason Jordan in a 3-way tag team match. April 18, 2015 – NXT Live Event: NXT tag team champions Blake and Murphy defeated The Vaudevillains to retain the titles. May 8, 2015 – NXT Live Event: Dash Wilder and Scott Dawson defeated Aiden English and Simon Gotch. May 9, 2015 – NXT Live Event: The Vaudevillains defeated Scott Dawson and Dash Wilder. May 20, 2015 – NXT TakeOver – Unstoppable: The Vaudevillains defeated Dash Wilder and Scott Dawson in a dark match. May 23, 2015 – NXT Live Event: The Vaudevillains defeated Scott Dawson and Dash Wilder. May 30, 2015 – NXT Live Event: The Vaudevillains defeated Angelo Dawkins and Scott Dawson. June 3, 2015 – NXT: The Vaudevillains defeated Jason Jordan and Marcus Louis. June 5-6, 2015 – NXT Live Event: The Vaudevillains defeated Dash Wilder and Scott Dawson. June 11, 2015 – NXT Live Event: Mojo Rawley and Zack Ryder defeated The Vaudevillains. June 12-13, 2015 – NXT Live Event: Colin Cassady and Enzo Amore defeated The Vaudevillains. June 17, 2015 – NXT: The Vaudevillains defeated Jason Jordan and Mikaze in a dark match. June 26, 2015 – NXT Live Event: The Vaudevillains defeated Chad Gable and Jason Jordan & NXT tag team champions Blake and Murphy in a 3-way non-title match. June 27, 2015 – NXT Live Event: The Vaudevillains defeated Chad Gable and Jason Jordan. July 1, 2015 – NXT: The Vaudevillains defeated Dash Wilder and Scott Dawson. July 8, 2015 – NXT: The Vaudevillains defeated Colin Cassady and Enzo Amore w Carmella to become #1 contender for the tag team titles. July 9, 2015 – NXT Live Event: NXT tag team champions Blake and Murphy defeated The Vaudevillains & Colin Cassady and Enzo Amore in a 3-way tag team non-title match. July 10, 2015 – NXT Live Event: The Vaudevillains defeated Chad Gable and Jason Jordan & NXT tag team champions Blake and Murphy in a 3-way non-title match. July 18, 2015 – NXT Live Event: The Vaudevillains defeated NXT tag team champions Blake and Murphy by disqualification. July 22, 2015 – NXT: The Vaudevillains defeated Sawyer Fulton and Angelo Dawkins. July 23, 2015 – NXT Live Event: Mike Rawlis, Steve Cutler and The Vaudevillains defeated Blake, Murphy, Dash Wilder and Scott Dawson. July 24, 2015 – NXT Live Event: The Vaudevillains defeated NXT tag team champions Blake and Murphy by disqualification. July 25, 2015 – NXT Live Event: The Vaudevillains defeated NXT tag team champions Blake and Murphy in a non-title match. July 29, 2015 – NXT: NXT tag team champions Blake and Murphy and Alexa Bliss defeated The Vaudevillains to retain the titles. July 30, 2015 – NXT Live Event: The Vaudevillains defeated Blake and Murphy, Chad Gable and Jason Jordan & Dash Wilder and Scott Dawson by disqualification in a 4-way tag team match. July 31, 2015 – NXT Live Event: The Vaudevillains defeated Blake and Murphy, Chad Gable and Jason Jordan & Dash Wilder and Scott Dawson in a 4-way tag team match. August 7, 2015 – NXT Live Event: The Vaudevillains and Bayley defeated Blake, Murphy and Alexa Bliss. August 8, 2015 – NXT Live Event: The Vaudevillains defeated Chad Gable and Jason Jordan. August 15, 2015 – NXT: The Vaudevillains defeated Blake and Murphy in a non-title match. August 22, 2015 – NXT: The Vaudevillains w Blue Pants defeated Blake and Murphy w Alexa Bliss to win the NXT tag team titles. August 27, 2015 – NXT Live Event: NXT tag team champions The Vaudevillains defeated Blake and Murphy to retain the titles. August 28, 2015 – NXT Live Event: NXT tag team champions The Vaudevillains defeated Chad Gable and Jason Jordan in a non-title match. August 29, 2015 – NXT Live Event: The Vaudevillains and Jasmin defeated Blake, Murphy and Alexa Bliss. September 3, 2015 – NXT Live Event: NXT tag team champions The Vaudevillains defeated Chad Gable and Jason Jordan to retain the titles. September 4, 2015 – NXT Live Event: NXT tag team champions The Vaudevillains defeated Blake and Murphy in a non-title 1st round match. September 17, 2015 – NXT Live Event: NXT tag team champions The Vaudevillains defeated Blake and Murphy to retain the titles. September 18, 2015 – NXT Live Event: Dash Wilder and Scott Dawson defeated The Vaudevillains in a non-title quarter-finals tag team match. September 19, 2015 – NXT Live Event: NXT tag team champions The Vaudevillains defeated Chad Gable and Jason Jordan to retain the titles. September 23, 2015 – NXT: NXT tag team champions The Vaudevillains defeated Blake and Murphy w Alexa Bliss to retain the titles. September 24, 2015 – NXT Live Event: NXT tag team champions The Vaudevillains defeated Baron Corbin and Riddick Moss in a non-title match. October 2-3, 2015 – NXT Live Event: NXT tag team champions The Vaudevillains defeated Dash Wilder and Scott Dawson to retain the titles. October 4, 2015 – NXT Live Event: NXT tag team champions The Vaudevillains defeated Chad Gable and Jason Jordan to retain the titles. October 10, 2015 – NXT Live Event: The Vaudevillains and Finn Balor defeated Blake, Murphy and Tye Dillinger. October 14, 2015 – NXT: NXT tag team champions The Vaudevillains defeated Angelo Dawkins and Sawyer Fulton in a non-title match. October 15, 2015 – NXT Live Event: NXT tag team champions The Vaudevillains defeated Dash Wilder and Scott Dawson to retain the titles. October 16, 2015 – NXT Live Event: NXT tag team champions The Vaudevillains defeated Blake and Murphy, Zack Ryder and Mojo Rawley & Chad Gable and Jason Jordan in a 4-way tag team match to retain the titles. October 17, 2015 – NXT Live Event: The Vaudevillains, Finn Balor and Bayley defeated Blake, Murphy, Tye Dillinger and Alexa Bliss. October 24, 2015 – NXT Live Event: Dash Wilder and Scott Dawson defeated The Vaudevillains. October 25, 2015 – NXT Live Event: The Vaudevillains defeated Chad Gable and Jason Jordan. November 5, 2015 – NXT Live Event: The Vaudevillains defeated NXT tag team champions Dash Wilder and Scott Dawson by DQ. Dash & Dawson retains. November 6, 2015 – NXT Live Event: The Vaudevillains defeated Steve Cutler and Tino Sabbatelli. November 7, 2015 – NXT Live Event: NXT tag team champions Dash Wilder and Scott Dawson defeated The Vaudevillains, Blake and Murphy & Chad Gable and Jason Jordan in a 4-way tag team match to retain the titles. November 11, 2015 – NXT: Dash Wilder and Scott Dawson defeated The Vaudevillains to win the NXT tag team titles. November 12, 2015 – NXT Live Event: The Vaudevillains defeated NXT tag team champions Dash Wilder and Scott Dawson by disqualification. Dash & Dawson retains. November 13, 2015 – NXT Live Event: Apollo Crews, Chad Gable, Jason Jordan & The Vaudevillains (Aiden English and Simon Gotch) defeated Baron Corbin, Blake, Dash Wilder, Murphy and Scott Dawson in a tag team elimination match. November 20, 2015 – NXT Live Event: The Vaudevillains defeated Angelo Dawkins and Tino Sabbatelli. November 21, 2015 – NXT Live Event: The Vaudevillains defeated Alexander Wolfe and Sunny Dhinsa. November 25, 2015 – NXT: NXT tag team champions Dash Wilder and Scott Dawson defeated The Vaudevillains to retain the titles. December 4, 2015 – NXT Live Event: Chad Gable and Jason Jordan defeated The Vaudevillains. December 5, 2015 – NXT Live Event: The Vaudevillains defeated NXT tag team champions Dash Wilder and Scott Dawson by disqualification. Dash & Dawson retains. December 23, 2015 – NXT: Chad Gable and Jason Jordan defeated Blake and Murphy, The Vaudevillains and Mojo Rawley and Zack Ryder in a 4-way tag team match. January 14-15, 2016 – NXT Live Event: The Hype Bros (Mojo Rawley and Zack Ryder) defeated The Vaudevillains (Aiden English and Simon Gotch). January 29, 2016 – NXT Live Event: American Alpha (Chad Gable and Jason Jordan) defeated The Vaudevillains (Aiden English and Simon Gotch). January 30, 2016 – NXT Live Event: Colin Cassady and Enzo Amore defeated The Vaudevillains (Aiden English and Simon Gotch). February 3, 2016 – NXT: The Vaudevillains (Aiden English and Simon Gotch) defeated The Hype Bros (Mojo Rawley and Zack Ryder). February 5, 2016 – NXT Live Event: The Hype Bros (Mojo Rawley and Zack Ryder) defeated The Vaudevillains (Aiden English and Simon Gotch). February 6, 2016 – NXT Live Event: The Hype Bros (Mojo Rawley and Zack Ryder) defeated The Vaudevillains (Aiden English and Simon Gotch) in a best 2 out of 3 falls match. February 11, 2016 – NXT Live Event: American Alpha (Chad Gable and Jason Jordan) defeated The Vaudevillains (Aiden English and Simon Gotch). February 13, 18-20, 2016 – NXT Live Event: Colin Cassady and Enzo Amore defeated The Vaudevillains (Aiden English and Simon Gotch). February 25, 2016 – NXT Live Event: American Alpha (Chad Gable and Jason Jordan) defeated The Vaudevillains (Aiden English and Simon Gotch), Blake and Murphy & Colin Cassady and Enzo Amore in a 4-way tag team elimination match to become #1 contender for the tag titles. February 26, 2016 – NXT Live Event: The Vaudevillains (Aiden English and Simon Gotch) defeated Kenneth Crawford and Patrick Clark. March 2, 2016 – NXT: The Vaudevillains (Aiden English and Simon Gotch) defeated Hugo Knox and Tucker Knight. March 3, 2016 – NXT Live Event: Johnny Gargano and Tommaso Ciampa defeated The Vaudevillains (Aiden English and Simon Gotch). March 4-5, 2016 – NXT Live Event: American Alpha (Chad Gable and Jason Jordan) defeated The Vaudevillains (Aiden English and Simon Gotch). March 6, 2016 – NXT Live Event: Aiden English vs. Dan Matha ended in a no contest. Dan Matha and Dylan Miley defeated The Vaudevillains (Aiden English and Simon Gotch). March 16, 2016 – NXT: American Alpha (Chad Gable and Jason Jordan) defeated The Vaudevillains (Aiden English and Simon Gotch) to become #1 contenders for the NXT tag team titles. March 18-19, 2016 – NXT Live Event: Colin Cassady and Enzo Amore defeated The Vaudevillains (Aiden English and Simon Gotch). March 24, 2016 – NXT Live Event: Mojo Rawley and Zack Ryder defeated The Vaudevillains. April 13, 2016 – NXT: Johnny Gargano and Tommaso Ciampa defeated The Vaudevillains (Aiden English and Simon Gotch). May 7, 2016 – NXT Live Event: The Vaudevillains (Aiden English and Simon Gotch) defeated The Revival (Dash Wilder and Scott Dawson). April 2, 2016 – WrestleMania Axxess: Colin Cassady and Enzo Amore defeated The Vaudevillains (Aiden English and Simon Gotch). April 3, 2016 – WrestleMania Axxess: The Vaudevillains (Aiden English and Simon Gotch) defeated Corey Hollis and John Skyler. April 14, 2016 – SmackDown: The Vaudevillains defeated Goldust and Fandango to advance in the WWE Tag Team Championship #1 contenders tournament. April 18, 2016 – RAW: The Vaudevillains defeated The Usos to advance in the WWE Tag Team Championship #1 contenders tournament. May 1, 2016 – Payback: Enzo Amore & Big Cass vs. The Vaudevillains ended in a No Contest due to an injury to Enzo. May 2, 2016 – RAW: WWE Tag Team Champions The New Day & Colin Cassady defeated The Vaudevillains & The Dudley Boyz. May 5, 2016 – SmackDown: The Vaudevillains defeated The Social Outcasts’ Curtis Axel & Bo Dallas. May 12, 2016 – Smackdown: Aiden English (w/Simon Gotch) defeated Kofi Kingston (w/Big E & Xavier Woods). May 14-15, 2016 – Live Event: WWE tag team champions Big E and Xavier Woods defeated The Vaudevillains to retain the titles. May 19, 2016 – SmackDown: WWE Tag Team Champions The New Day (Kofi Kingston, Xavier Woods & Big E) & Big Cass defeated The Dudley Boyz (Bubba Ray Dudley & D-Von Dudley) & The Vaudevillains (Aiden English & Simon Gotch). May 22, 2016 – Extreme Rules: WWE tag team champions The New Day (Big E and Xavier Woods) w Kofi Kingston defeated The Vaudevillains to retain. May 21-22, 28, 2016 – Live Event: WWE tag team champions Big E and Xavier Woods defeated The Vaudevillains to retain the titles. May 29, 2016 – Live Event: WWE tag team champions The New Day (Big E and Kofi Kingston) defeated The Shining Stars (Epico and Primo) & The Vaudevillains (Aiden English and Simon Gotch) in a 3-way tag team elimination match to retain the tag team titles. May 30, 2016 – RAW: WWE tag team champions The New Day (Big E and Kofi Kingston) w Xavier Woods defeated The Vaudevillains (Aiden English and Simon Gotch) by disqualification in a non-title match. June 4, 2016 – Main Event: Big Cass and Enzo Amore defeated The Vaudevillains. June 6, 2016 – RAW: The Vaudevillains (Aiden English and Simon Gotch) defeated Big Cass and Enzo Amore by disqualification. June 13, 2016 – RAW: The Club (Karl Anderson & Luke Gallows) & The Vaudevillains (Aiden English and Simon Gotch) defeated Big Cass, Enzo Amore & The New Day (Big E and Kofi Kingston) w Xavier Woods. June 16, 2016 – SmackDown: Kofi Kingston (w/Big E & Xavier Woods) defeated Aiden English (w/Simon Gotch), Big Cass (w/Enzo Amore) and Luke Gallows (w/Karl Anderson) in a fatal 4-way match. June 19, 2016 – Money in the Bank: WWE tag team champions The New Day (Big E and Kofi Kingston) w Xavier Woods defeated Big Cass and Enzo Amore, The Club (Karl Anderson and Luke Gallows) & The Vaudevillains (Aiden English & Simon Gotch) in a fatal 4-way tag team match to retain the tag titles. June 20, 2016 – RAW: Big Cass and Enzo Amore defeated The Vaudevillains (Aiden English and Simon Gotch). June 23, 2016 – SmackDown: WWE tag team champions The New Day (Big E, Kofi Kingston) w Xavier Woods defeated The Vaudevillains in a non-title match. July 4, 2016 – RAW: The Golden Truth (Goldust and R-Truth) defeated The Vaudevillains (Aiden English and Simon Gotch). July 9, 2016 – Main Event: WWE tag team champions The New Day (Big E, Kofi Kingston) w Xavier Woods defeated The Vaudevillains in a non-title, dark match. July 10, 2016 – Live Event: Jack Swagger and Kane defeated the Vaudevillains. July 11, 2016 – RAW: Both Vaudevillains members were in the #1 contenders battle royal for the Intercontinental title won by Darren Young. July 15, 2016 – Main Event: Apollo Crews, Jack Swagger & The Golden Truth (Goldust and R-Truth) defeated The Ascension (Konnor & Viktor) & The Vaudevillains (Aiden English and Simon Gotch). July 16-17, 2016 – Live Event: Kane and The Big Show defeated The Vaudevillains. July 26, 2016 – SmackDown Live: Both Vaudevillains members were in the battle royal won by Apollo Crews. July 29, 2016 – Main Event: The Hype Bros (Mojo Rawley and Zack Ryder) defeated The Vaudevillains (Aiden English and Simon Gotch). July 30-31, 2016 – Live Event: Cesaro and Neville defeated The Vaudevillains (Aiden English and Simon Gotch). August 2, 2016 – Smackdown Live: American Alpha (Chad Gable and Jason Jordan) defeated The Vaudevillains (Aiden English and Simon Gotch). August 26-28, 2016 – Live Event: Big Cass and Enzo Amore defeated The Vaudevillains (Aiden English and Simon Gotch). August 29, 2016 – Live Event: The Usos (Jey Uso and Jimmy Uso) defeated The Vaudevillains (Aiden English and Simon Gotch). August 30, 2016 – SmackDown Live: The Hype Bros (Mojo Rawley and Zack Ryder) defeated The Vaudevillains (Aiden English and Simon Gotch) in the 1st round of the tag team titles tournament. September 10, 2016 – Live Event: Heath Slater, Rhyno, Jason Jordan, Mojo Rawley and Zack Ryder defeated The Vaudevillains, The Ascension and Baron Corbin. September 12, 2016 – Live Event: Jason Jordan, Mojo Rawley and Zack Ryder defeated Konnor and The Vaudevillains. September 18, 2016 – Live Event: Jason Jordan defeated Simon Gotch. October 1-3, 2016 – Live Event: American Alpha (Chad Gable & Jason Jordan) & The Hype Bros (Mojo Rawley & Zack Ryder) defeated The Ascension (Konnor & Viktor) & The Vaudevillains (Aiden English & Simon Gotch). October 4, 2016 – SmackDown Live: The Hype Bros (Mojo Rawley and Zack Ryder) defeated The Vaudevillains (Aiden English and Simon Gotch). October 8, 10, 2016 – Live Event: American Alpha (Chad Gable & Jason Jordan) & The Hype Bros (Mojo Rawley & Zack Ryder) defeated The Ascension (Konnor & Viktor) & The Vaudevillains (Aiden English & Simon Gotch). October 9, 2016 – No Mercy Kickoff: American Alpha (Chad Gable & Jason Jordan) & The Hype Bros (Mojo Rawley & Zack Ryder) defeated The Ascension (Konnor & Viktor) & The Vaudevillains (Aiden English & Simon Gotch). October 14, 2016 – Main Event: The Hype Bros (Mojo Rawley and Zack Ryder) defeated The Vaudevillains (Aiden English and Simon Gotch). October 15, 2016 – Live Event: Heath Slater & The Hype Bros (Mojo Rawley & Zack Ryder) defeated Aiden English & The Ascension (Konnor & Viktor). October 17, 2016 – Live Event: Heath Slater & The Hype Bros (Mojo Rawley & Zack Ryder) defeated Konnor & The Vaudevillains (Aiden English & Simon Gotch). October 22-24, 2016 – Live Event: American Alpha (Chad Gable & Jason Jordan) & The Hype Bros (Mojo Rawley & Zack Ryder) defeated The Ascension (Konnor & Viktor) & The Vaudevillains (Aiden English & Simon Gotch). October 28, 2016 – Main Event: American Alpha (Chad Gable and Jason Jordan) defeated The Vaudevillains (Aiden English and Simon Gotch). October 30-31, 2016 – Live Event: Apollo Crews & The Hype Bros (Mojo Rawley and Zack Ryder) defeated Curt Hawkins & The Vaudevillains (Aiden English and Simon Gotch). November 4, 2016 – Main Event: Jack Swagger defeated Simon Gotch. November 9-10, 2016 – Live Event: The Hype Bros (Mojo Rawley and Zack Ryder) defeated The Vaudevillains (Aiden English and Simon Gotch). November 22, 2016 – SmackDown Live: American Alpha (Chad Gable & Jason Jordan) defeated Breezango (Fandango & Tyler Breeze), The Ascension (Konnor & Viktor), The Hype Bros (Mojo Rawley & Zack Ryder), The Usos (Jey Uso & Jimmy Uso) and The Vaudevillains (Aiden English & Simon Gotch) in a tag team turmoil match to become #1 contenders for the tag titles. November 21, 26-28, 2016 – Live Event: American Alpha (Chad Gable & Jason Jordan), Apollo Crews & The Hype Bros (Mojo Rawley and Zack Ryder) defeated Curt Hawkins, The Ascension (Konnor & Viktor) & The Vaudevillains (Aiden English and Simon Gotch). December 4, 2016 – TLC Kickoff: American Alpha (Chad Gable & Jason Jordan), Apollo Crews & The Hype Bros (Mojo Rawley and Zack Ryder) defeated Curt Hawkins, The Ascension (Konnor & Viktor) & The Vaudevillains (Aiden English and Simon Gotch). December 26, 2016 – Live Event: Curt Hawkins & The Vaudevillains (Aiden English and Simon Gotch) defeated Apollo Crews, Jack Swagger and Mojo Rawley. January 7, 9, 2017 – Live Event: Heath Slater, Jack Swagger, Mojo Rawley, Rhyno & The Usos (Jey Uso and Jimmy Uso) defeated Breezango (Fandango & Tyler Breeze), The Ascension (Konnor & Viktor) & The Vaudevillains (Aiden English and Simon Gotch). January 21-23, 2017 – Live Event: Jack Swagger and Mojo Rawley defeated The Vaudvillains (Aiden English and Simon Gotch). March 18-20, 2017 – Live Event: Heath Slater, Kalisto and Rhyno defeated Curt Hawkins & The Vaudevillains (Aiden English and Simon Gotch). March 23-25, 2017 – Live Event: Apollo Crews, Heath Slater, Mojo Rawley and Rhyno defeated Breeezango (Fandango & Tyler Breeze) & The Vaudevillains (Aiden English and Simon Gotch). April 2, 2017 – WrestleMania 33 Kickoff: Mojo Rawley defeated Aiden English and Apollo Crews and Bo Dallas and Braun Strowman and Chad Gable and Curt Hawkins and Curtis Axel and Dolph Ziggler and Epico and Fandango and Goldust and Heath Slater and Jey Uso and Jimmy Uso and Jinder Mahal and Kalisto and Killian Dain and Luke Harper and Mark Henry and Primo and R-Truth and Rhyno and Sami Zayn and Simon Gotch and Sin Cara and The Big Show and Tian Bing and Titus O’Neil and Tyler Breeze to win the Andre The Giant Memorial Battle Royal. April 4, 2017 – SmackDown Live: American Alpha (Chad Gable and Jason Jordan) defeated The Vaudevillains (Aiden English and Simon Gotch) in a dark match. April 5, 2017: Simon Gotch asked for his WWE released and was granted. July 8, 2017 – WOW: JGeorge defeated Simon Grimm. July 15, 2017 – ComPro: Brian Breaker defeated Simon Grimm to retain the heavyweight title. July 22, 2017 – XWA 47: Simon Grimm defeated Matt Riddle. July 23, 2017 – XWA 48: Simon Grimm defeated Daisuke Sekimoto and Doug Williams in a 3-way match to win the vacant XWA Frontier Sports Title. July 28, 2017 – PWP: Simon Grimm defeated Doug Williams. July 29, 2017 – Wrestling League: James Castle defeated Simon Grimm. July 30, 2017 – PWP: Simon Grimm defeated Ultimo Tiger. August 4, 2017 – PWR/Rockstar Pro: Simon Grimm defeated Ethan Page in the 1st round. AR Fox defeated Simon Grimm in the semi-finals. August 24, 2017 – Zela Pro: Isaias Velazquez defeated GPA and Simon Grimm in a 3-way match. September 1, 2017 – CHIKARA: Simon Grimm & The Throwbacks (Dasher Hatfield and Mark Angelosetti) defeated The Anti-Fun Police (Chief Deputy Dunne, Jim Obstruction and Leigh Obstruction) in the 1st round. September 2, 2017 – CHIKARA: British Strong Style (Pete Dunne, Trent Seven and Tyler Bate) defeated The Throwbacks (Dasher Hatfield & Mark Angelosetti) and Simon Grimm in the quarter-finals of the King Of Trios tournament. September 23, 2017 – BLP: Simon Grimm defeated B-Boy, Kevin Lee Davidson and Space Monkey in 4-way 1st round match. Tom Lawlor defeated Darby Allin, Dasher Hatfield, Dominic Garrini, Sammy Guevara and Simon Grimm in a 6-way semi-finals match of the BLP title tournament. October 7, 2017 – XWA 49: Cara Noir defeated Simon Grimm. October 8, 2017 – XWA 50: Simon Grimm defeated Doug Williams to retain the Frontier Sports title. October 27, 2017 – Prestige 3: Tom Lawlor defeated Simon Grimm. November 11, 2017 – ROH Elite: Jonathan Gresham defeated Josh Woods and Simon Grimm in a 3-way match. December 23, 2017 – ROH TV (Taped): The Dawgs (Rhett Titus and Will Ferrara) defeated Flip Gordon and Simon Grimm. January 6, 2018 – ROH TV (Taped): Silas Young w The Beer City Bruiser defeated Simon Grimm to retain the World Television title. January 14, 2018 – WHAT: Ethan Page defeated Simon Grimm. February 8, 2018 – MLW: Seth Petruzelli and Simon Grimm defeated Jason Cade and Jimmy Yuta. March 7, 2018 – IPW:UK: Mark Haskins defeated Simon Grimm. March 10, 2018 – BCW: Joe Coffey defeated Simon Grimm. March 11, 2018 – XWA 52: Simon Grimm defeated James Castle and Jonny Storm in a 3-way match to retain the Frontier Sports title. March 31, 2018 – FEST: Simon Grimm defeated Brody King. April 12, 2018 – MLW: ACH defeated Simon Grimm. April 15, 2018 – C4: Matt Angel defeated Simon Grimm. April 20, 2018 – Zelo Pro: Gringo Loco defeated Arik Cannon, Craig Mitchell, Simon Grimm and Pat Monix in a 5-way match. April 21, 2018 – BLP: Fred Yehi defeated Simon Grimm. April 27, 2018 – FU: Simon Grimm defeated Mojo McQueen. April 28, 2018 – FW: Kobe Durst defeated Simon Grimm. April 29, 2018 – XICW: Jimmy Jacobs defeated Simon Grimm to retain the Midwest heavyweight title. May 5, 2018 – MPW: Killer Kross defeated Simon Grimm. May 19, 2018 – ESW: Brandon Thurston defeated Simon Grimm. May 25, 2018 – MLW Fusion #6 – Zero Fear (Taped): Simon Grimm defeated Danny Santiago in a Simon Gotch Prize Fight Challenge match. June 15, 2018 – MLW Fusion #9 (Taped): Simon Grimm defeated Mike Parrow in the Simon Gotch Prize Fight Challenge match. June 24, 2018 – Bumps And Brewses: Tyler Bateman defeated Simon Grimm. July 6, 2018 – MLW (Taped): ACH and Rich Swann defeated Team Filthy (Simon Gotch and Tom Lawlor). July 27, 2018 – MLW (Taped): Simon Gotch was in the 40 man battle riot won by Tom Lawlor. July 27, 2018 – BTW: Simon Gotch defeated Kal Jak. August 3, 2018 – MLW (Taped): Jake Hager defeated Simon Gotch. August 18, 2018 – PPW: Sean Carr defeated Simon Gotch. August 24, 2018 – MLW (Taped): Team Filthy (Fred Yehi and Simon Gotch) defeated The Dirty Blondes (Leo Brien and Mike Patrick). August 24, 2018 – Zelo Pro 1 Year Anniversary Show: Simon Grimm defeated Pat Monix. August 26, 2018 – AML: Billy Brash defeated Simon Grimm to retain the AML title. August 31, 2018 – MLW (Taped): Simon Gotch defeated Angel Pierce in a Simon Gotch Prize Fight Challenge Match 500$ cash prize match. September 6, 2018 – MLW: Simon Gotch defeated Gangrel by disqualification in the Simon Gotch Prize Fight Challenge. September 8, 2018 – FEST: Simon Grimm defeated Serpentico. September 16, 2018 – XICW: Simon Grimm defeated Dre Jacobs to win the Xtreme Intense title. September 22, 2018 – MPX: Andy Dalton defeated Rey Ortiz and Simon Gotch in a 3-way match. September 23, 2018 – Bumps And Brewses: Simon Grimm defeated Funny Bone. September 30, 2018 – GWC: Joe Black defeated Simon Gotch to retain the GWC title. October 4, 2018 – MLW: Simon Gotch defeated Fallah Bahh. October 13, 2018 – XICW: Dre Jacobs defeated Simon Grimm to win the Xtreme Intense title. October 28, 2018 – FEST: Simon Grimm defeated Matt Cross. November 3, 2018 – Revive Pro Bringing A Revival: Jeremy Davis defeated Simon Grimm. November 8, 2018 – MLW: Simon Gotch defeated Ariel Dominguez. November 24, 2018 – WrestleCade: Simon Grimm was in the battle royal won by Fallah Bahh. December 13, 2018 – MLW: Tom Lawlor defeated Simon Gotch in a no holds barred match. December 14, 2018 – MLW: Ace Romero defeated Simon Gotch in the Simon Gotch Prize Fight Challenge. @deviousjourney Ogami Itto. Ogami Daigoro. Assassins. On the road to Hell. @ZeloWrestling @joesonweedst @IamKylieRae @ProjectMONIX @deviousjourney @DazeZhaVoo @RealBrittBaker @JesusBryceWalks @LaynieLuck @GPAthinks @ElaynaBlack We will be there! 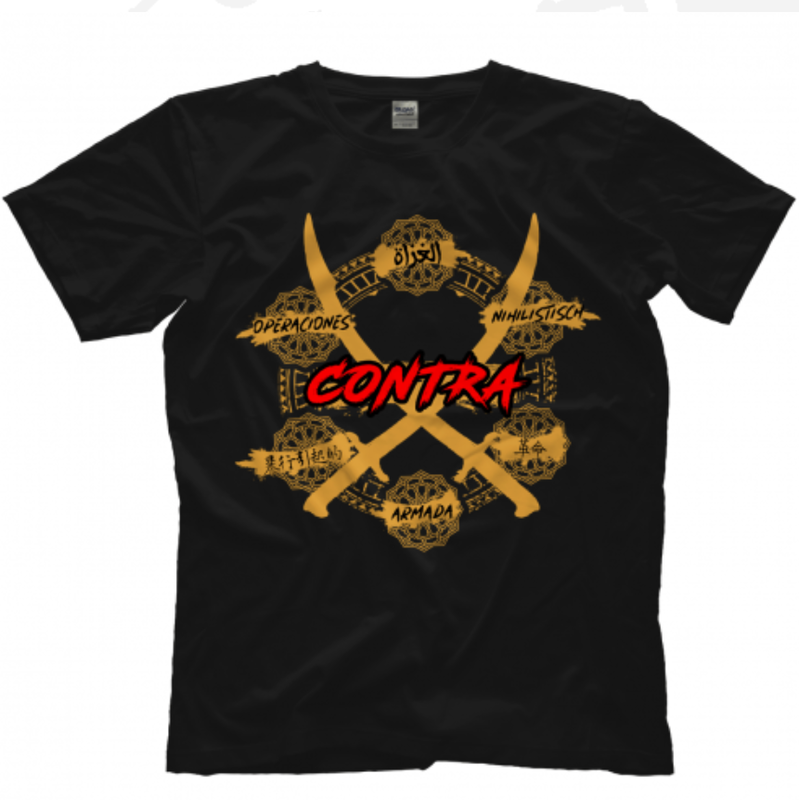 Rise up with the global dealers of violence and represent #CONTRAUnit on the streets with their new shirt!